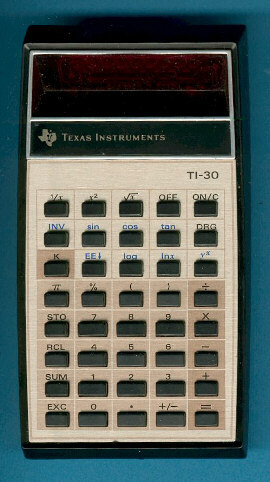 Later during production the sticker was replaced to match the US-design, view a TI-30 manufactured in Italy in 1980 here. In the meantime we discovered a rare TI-30 with a completely different keyboard technology. Don't miss the rare TI-30/super manufactured for Koh-I-Noor Hardtmuth.